A Swiss tourist couple was attacked by five youth in Agra's Fatehpur Sikri in Uttar Pradesh leaving them battered and bruised. Lucknow/New Delhi: A young Swiss tourist couple was attacked by five youth in Agra's Fatehpur Sikri in Uttar Pradesh leaving them battered and bruised after which all of them were nabbed, police said on Thursday. 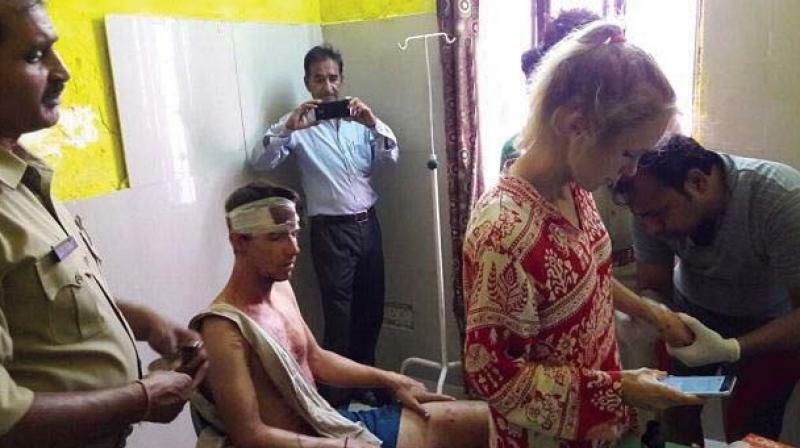 As the Centre and the Uttar Pradesh government condemned the attack on Sunday, doctors said Quentin Jeremy Clerc, 24, who came to India on September 30 with his female friend Marie Droz, also 24, are on the way to recovery. UP Secretary (Home) Bhagwan Swarup on Thursday night said five people were found to be involved in the incident. "All five have been arrested/apprehended. Prima facie, two appear be major and the rest three minors," he said in a statement. Dr Rajendra Prasad, neurosurgeon at the Apollo Hospital in Delhi where the couple was admitted, said Clerc has been shifted to the ward from the ICU. He said Droz has a fracture in her arm but has been discharged after treatment. "We have moved him(Clerc) out of the ICU into a room. He is having a hearing problem otherwise he is conscious and talking," said Prasad, adding it is difficult to say at this stage whether he has suffered permanent hearing damage. "He's improving but we will have to see in the long term," he said. Prasad said the duo is in a state of shock and that Droz is at present with her male friend. The couple from Lausanne in Switzerland was chased and attacked on Sunday with stones and sticks by a group of four youth in the tourist town of Fatehpur Sikri, about 40 km from Agra, according to media accounts of the incident. "The Embassy of Switzerland in New Delhi confirms that two Swiss citizens were attacked in India," the Embassy said in a statement, adding, "In the framework of consular protection services, the Embassy is providing support to them. For reasons of privacy and data protection, the Embassy cannot communicate any further information in this regard." UP Chief Minister Yogi Adityanath, who was in Agra to visit Taj Mahal in an apparent damage control exercise following the controversy over its place in Indian heritage set off by BJP leaders, said two attackers have been arrested. "Two attackers have been arrested, and strict action will be taken against those (other people) involved in the attack," he told reporters in Agra. "We have given instructions to police to strictly deal with such people. Our government will not accept such incidents," he added. External Affairs Minister Sushma Swaraj sought a report from the UP government on the attack and said the government is monitoring the progress of Clerc and Droz. In a series of tweets, the minister said, "our Joint Secretary S Bhattacharjee and Indian Ambassador designate to Switzerland C B George met Swiss nationals Clerc and Marie Droz in hospital this morning". She also tweeted that these officials spoke to the concerned doctors who told them that while Droz has been discharged, Clerc is improving. Union Minister of State for Tourism K J Alphons dashed off a letter to Yogi Adityanath, saying the incident could have a negative impact on the image of the country. Alphons said he was "deeply concerned" over the attack. "A fast and speedy response in identifying and ensuring speedy action, including conviction of the guilty, would be reassuring, as also a good message of our efforts to prevent recurrence of such incidents," the minister wrote. Union Culture Minister Mahesh Sharma, who held the tourism portfolio before the recent reshuffle and who played a significant role in organising the 'Paryatan Parv', also said the incident was a matter of shame for the country. The incident came to light a day after the conclusion of the 'Paryatan Parv', India's biggest tourism festival which is aimed at increasing the tourist footfall in the country. "I condemn the attack on the foreign tourists. It is unfortunate and should not have happened. It is a matter of shame for us," he told PTI in Delhi. Additional Director General (ADG) Crime Chandra Prakash told reporters in Lucknow that on October 22 someone informed Dial 100 about the incident after which the couple was admitted to a primary health centre and later to a private hospital in Agra. "As the couple did not lodge any FIR, police suo motu lodged an NCR (non-cognisable report) in the matter," he said, adding that after medical report found a fracture in the arm of one of the tourists, relevant sections of the IPC were included in the FIR. Asked about the accused, the ADG said, "Initial reports said that some of them are minor. But as probe is on, it will not be fair to disclose their names." The couple was quoted as saying in a media report that they were strolling near the railway station at Fatehpur Sikri after a day in Agra when a group of youth started following them and later attacked. The couple said as they lay on the ground bloodied and bruised, bystanders began taking videos of them on their mobile phones, the report said.